If you’ve traveled at all in recent years, you may have felt the sting of overweight luggage fees. How can the airlines expect us to know how much our luggage weighs when my giant suitcase doesn’t even fit on my little household scale. My wife and I once had to reorganize the contents of our luggage to redistribute the weight on a flight back from Detroit… in the middle of the airport… during peak flying times. If that doesn’t sound fun to you, the easy answer is a digital luggage scale. 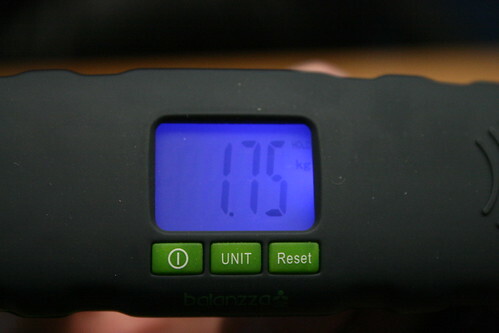 There’s a ton of them out there (pun intended), but the one I have to review today is the Balanzza Mini luggage scale. I honestly hadn’t owned a luggage scale before this one was sent my way, so I didn’t have a list of requirements for such a tool or expectations about how it should work or features I require. After having it for a while, however, I quickly noted several things I would want in a luggage scale. The number one feature I found comforting in the Balanzza Mini is the size and weight. Although I hadn’t thought of it before using this scale, it seems like a no-brainer that you’d want a small scale to not take up a lot of space in your luggage and if it’s heavy, it could do more harm than good in your effort to put your luggage on a diet. This scale is small at just under five inches long and it’s not too heavy, but it feels sturdy at about 0.2 lbs. The second most important feature in a luggage scale is the orientation. I’ve seen other scales that have a one-handed handle and I know that won’t work for me. They may be more convenient if you only have one hand free, but a luggage scale is most likely to be used with 40+ lb bags. While the Balanzza Mini’s two-handed orientation is nothing new, it’s rubberized grip was comfortable to use. The last of the features that I find necessary, which the Balanzza Mini covered well, included a screen that lights up for easier reading and that is not covered by your hands while in use and an easy way to attach whatever you want to weigh. In addition, this scale will deliver a weight reading in pounds or kilograms at your command. It’s been a pretty low travel year for me in terms of flights, so I didn’t have a need to try this scale out with my traditional airport luggage, but I did get to really put it to use. With a week-long, middle-of-nowhere hike around the corner, the weight of my hiking pack is even more frightening to me than a $60+ luggage surcharge from an airline. When you’re carrying everything on your back for 50 miles, every single ounce makes a difference. With that in mind, I’ve weighed not just the full pack, but many of the things I might take with me. My tent’s rain fly quickly became a victim of the scale’s unforgiving accuracy and was uninvited from my pack. Weighing everything allowed me to trim a few pounds from my pack so I can focus more on the adventure than the weight. The scale comes with a strap attached opposite the screen and right in the center. The strap has a clip, off-center, that snaps closed to secure the luggage while you use both hands to lift it up. After turning the scale on, it calibrates to zero and it’s ready to use. You just lift the scale up until it is fully supporting the weight of your bag. After a second, it settles on a weight and beeps to let you know. While I was packing my hiking pack, I left the scale connected and just lifted it now and then to get a reading. With a purchase price of around $18-$25 (via google), the Balanzza Mini BZ400 digital luggage scale will earn back its purchase price at least twofold on most airlines the first time it saves you from going over the weight restrictions. It’s a great little scale and will be my travel partner every time I fly. This is a must buy for yourself if you travel a lot or for that person in your life who does. This is a great little gadget. Nowadays with all your weight allowance restrictions something like this is a travelling must have. This is a pretty neat device. If you do a lot of traveling this would really come in handy. I try and use my scale to weight my bags, which turns into a balancing act. I don’t do all that much traveling, but if I did, I’d be all over this. Wow..very small for scaling luggage but powerful in style and feature.. They are small gadget but extremely useful tool for traveller. I have to agree with your conclusion. It only fits those who travel a lot. The price is just right for $18-$25 but I hope that it won’t be out of calibration that easy because it’s digital. This product can also be used to make sure children don’t carry more than what they are supposed to on their backpacks. If children are carrying 10-20% of their bodyweight in their backpacks it could be the source of low-level trauma, and chronic back pain. It’s very easy to use–just press a button to turn it on, then clip it onto the strap of your child’s schoolbag (or your luggage). Hold the balanzza and lift the item off the ground. In a few seconds it will beep and display the weight of the item. Searched on youtube to see a demonstration of it, I am quite impressed actually. I would of personally thought that the accuracy of it would not be very good, considering the fact that you are lifting it up, I thought perhaps any uneven pull force upwards might make for some errors in the weight. This is definitely going to be a big help to a lot of people, for sure. Especially those who go on shopping trips and end up with a lot of excess baggage. Balanzza Digital Luggage Scale make the measurement easy, Everyone could understand digital language that is why it might prove as best scale.